I know exactly what you saying. My partners sled at the time 15 600etec with 300 miles on it. Was at the La Cabanon in Dec-27-17.Wouldn’t start, fouled plugs, BAD GAS ECT. Spent all morning in Dennis’s groomer garage, sucking gas out, running to the doo dealer getting plugs and replacing. Warned him all off season to make sure he treated fuel accordingly. That day really sucked!!!!!! I’m using this configuration for the bag tours next season. Since I got this new sled unexpectedly this year, I’m able to break free for a short 3day ride. Going the La Cabanon 27-30.Just going to get out of break in and try to dial in sled to my liking, so my question is how is that area holding up. I was only commenting on the mileage on the filter,they should last atleast till 3k plus. Obviously being a victim of a bad tank on fill up will kill a filter regardless of mileage. Good to know.... That’s our spot if we are using the Jackman Maine crossing. Used the Fort Kent crossing last year. Curious on the new arrangement, might have to check it out next year. Wow that’s low mileage, I’ll do that in one bag trip.Thanks for the heads up. If it’s the old Bernieres then trail head and truck/ trailing packing across the street. Didn’t have issue with anything. Haven’t been there since 2017 so don’t know what has changed. How many miles on sled when you experienced your issue? My sweetspot is 45-75mph with the occasional wack of the throttle. I think this motor will do me just fine and with good mpg’s. 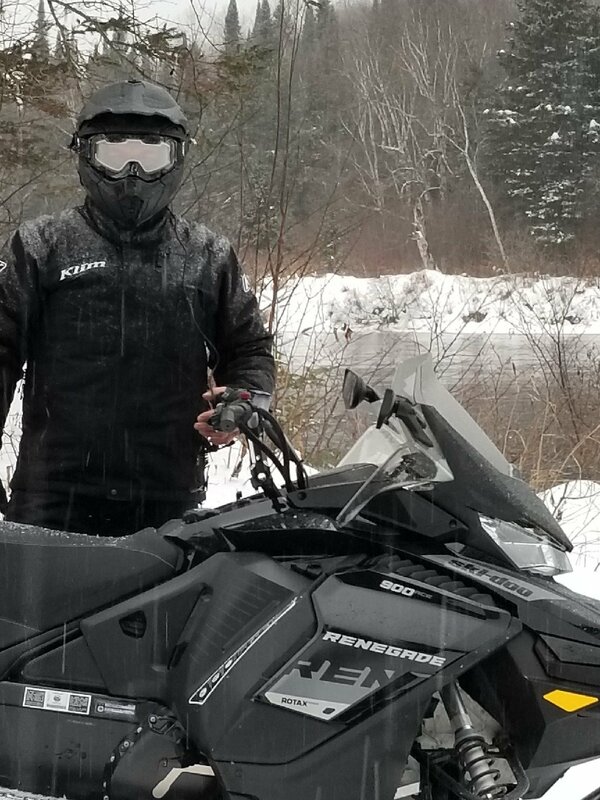 After about 30miles on the g4 renegade I was riding I got a handle on the characteristics and with minor adjustments on the trail I was happy being it was a rental. Now I’ll make this sled my own!!! keep me in the loop as far as any issues with the motor. Yea this color combo really looks sharp in person. Wasn’t sure initially. All my riding partners are all on pre 18 etecs so really curious on this 600r. Well since I was basically taking this season off and only did one small trip before the first of the year and being sledless. Came across a 19 renegade x 600r loaded with 0 miles. Not ridden due to injury. My new ride!!! Anybody running the new 600r? There’s nothing better than waking up in the morning, having a little breakfast, loading your saddlebags on the sled and having to break trail to get out of town. The M20 trail is one of my favorites. Your trip sounds awesome, enjoy!!! I have one of those DENNIS pictures myself!!! I took this pic when I was up Between Xmas/ New Years. Hey Viper2, never been on that local river trail between 23/360,how well is that marked or do I have to set a track on my Gps before traveling?. Btw... excellent post of your ride!!! Will be doing something similar next season myself. That’s where we staged from when we did our ride in 2017. We actually went up trail #3 and hung a left on trail# 93 to LSJ. Did our loop around and used trail # 23 for the return trip back to the Signature. Reason being we wanted to incorporate Mt Valin area while on our trip.Either way it’s a great ride. I use 2 maps as a reference, The Official Quebec map for I phone. Trak maps for my Garmin. Im not that rider that is clued to a gps while riding, I like to ride the trails how they are posted while having a general idea where I’m at and where I’m ending up. Only use GPS when I have to. With that said, Gps is a must while on a bag tour. The map on your phone works without cell service, uses your phone’s gps. Just make sure you activate the circle on the map ( location) and the blue circle follows you. cell reception is touch and go depends on towers and make sure you active the roaming ect. I have Verizon which I personally think works the best out of all of the carriers. I have unlimited data and calls Us/Canada. If you have AT&T good luck, horrible. Btw... compared my phone with the map and my buddies Garmin 680t and the Quebec map is spot on and faster for quick reference. He always just shook his head. A lot of good a valuable opinions when crossing the border for snowmobile trips. Don’t over think it though. Use a credit card for 90% of your spending with a 0 foreign transaction fee. Go to your local bank and get your Canadian money before leaving your state. I usually change out 500 US for a week bag trip. Bring your passport book along with your passport card if you have one. Make sure EVERYONE in your group has a CLEAN record, absolutely no Firearms, drugs ect. Really don’t want to ride around looking for banks ect. At the Jackman crossing, they were really cool guys and actually let us go indoors to warm up while checking paperwork ect. Fort Kent crossing was totally different, broke our balls coming out of New Brunswick even though we were going to the Northern Door across the street.A little excessive when the temperature was -20 at the time. Obviously this was crossing on snowmobile. That’s what those viper’s do. Happend to me when touring the LSJ in 2017. yamaha has no answer!!!! That’s exactly why I dumped my 15 viper with 8k at the end of last year. 2020 900 ace or 900t will be my next ride.